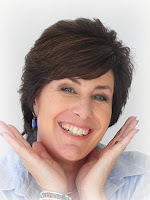 Sharing my ideas about working with resin, jewellery-making, creating leather jewellery, and lots of other crafty stuff. On my recent trip to the US, good friend, shopping guide and wonderful host, +Helen Bradley, took me bead shopping whilst in Cotati. At our first stop, she threw down the gauntlet - a jewellery making challenge. She picked up a bead that she knew I would never have bought and that is totally out of my comfort zone. 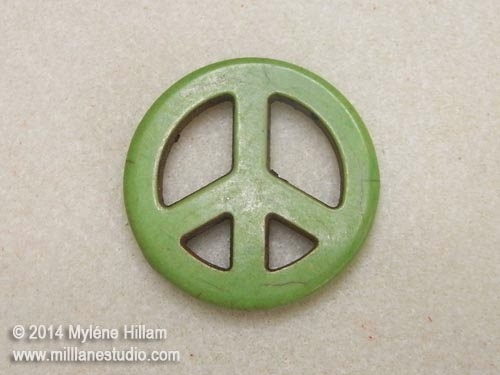 OK, a peace symbol is definitely not my style and even the colour is out of my comfort zone. But....... CHALLENGE ACCEPTED! Teaming it with a leather lace band is a pretty hip look and so on-trend at the moment, but that's been done before and it seemed like a cop out to go down that road - this is a challenge after all! 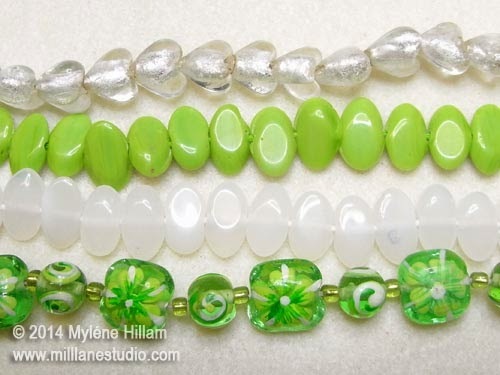 However, I did think it would make a great bracelet so I pulled out lots of green beads to see what I liked and this is the selection I made. 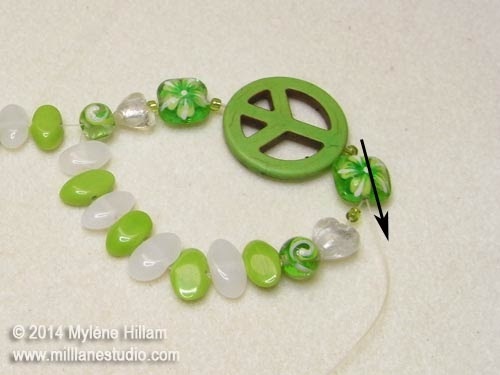 I love the handpainted square and round beads in the bottom row: the flowers are the pefect motif for a peace bracelet. And a couple of hearts won't be out of place either. I started off by cutting a 45cm (17 3/4") length of 0.5mm Stretch Magic. 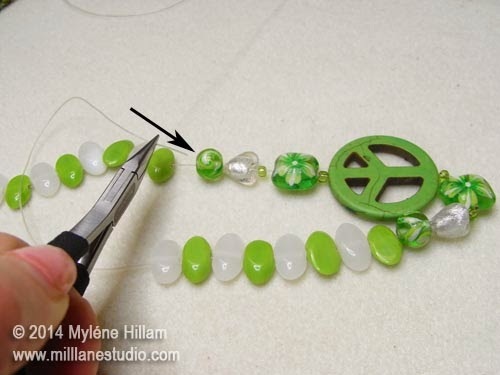 Even though 1.0mm fits comfortably inside these beads, the elastic needs to run through the beads twice so the narrower elastic works better for this design. It's always a good idea to pre-stretch the elastic which will help minimise overstretching once it's been worn a few times, so I gave it several good tugs before placing a bead stopper on one end. 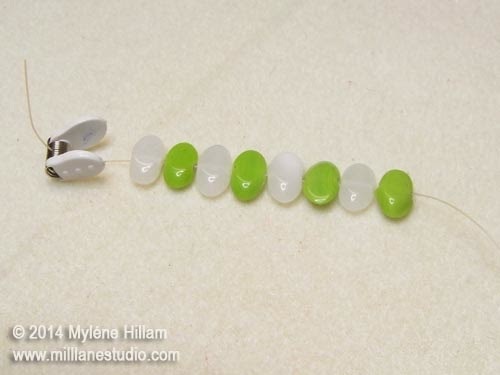 My stringing pattern is really simple: 4 milky white and 4 green flat ovals with the colours alternating. This is the underneath section of the bracelet. 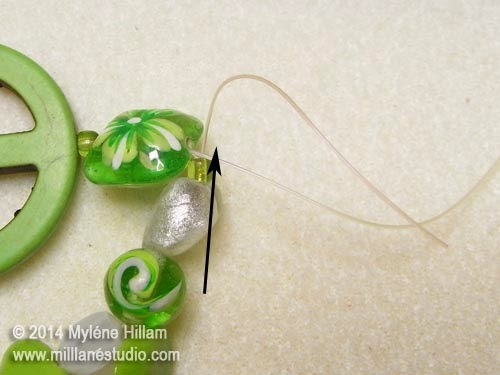 All the pretty beads are strung in the top section, along with the challenge bead. 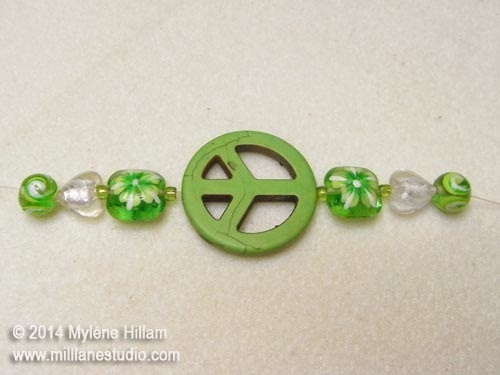 On the other side of the bracelet I've strung a second underneath section, in reverse order to the first one. So now I've got two underneath sections. You'll see why in the next few steps. 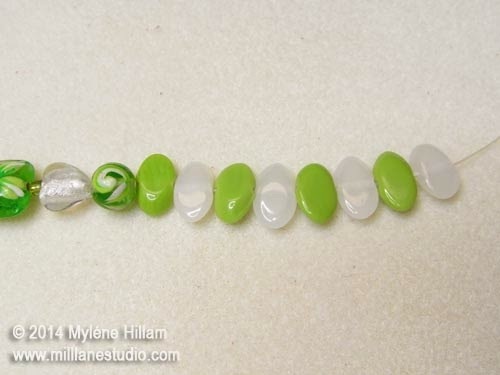 and exiting out the bottom of the second square bead, the bracelet is now circular. 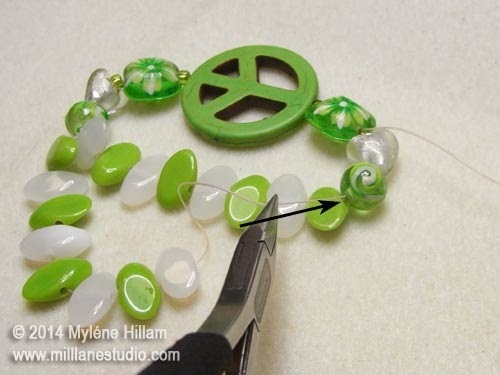 Now it's time to remove the bead stopper from the other end and thread it through the last three beads in the top section, creating a double strand of beads along the bottom of the bracelet. Now the two ends are together and ready to be tied off. I usually tie a half knot followed by a surgeon's knot, stretching both the cord and the knot tightly in between every knot I tie. I tied an extra double knot on this one to make sure it would hold. And even though my knot is tight, I like the added security of a dab of GS-Hypo cement. 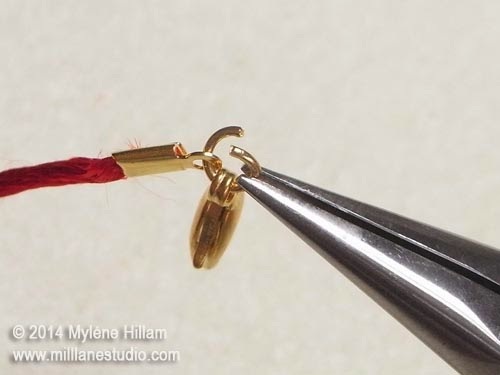 With the adhesive dry, I trim away the ends.... and slide the knot up inside the hole of the square bead where it can't be seen. and I might even be enticed to wear it so I think that I can say, Challenge successfully completed! 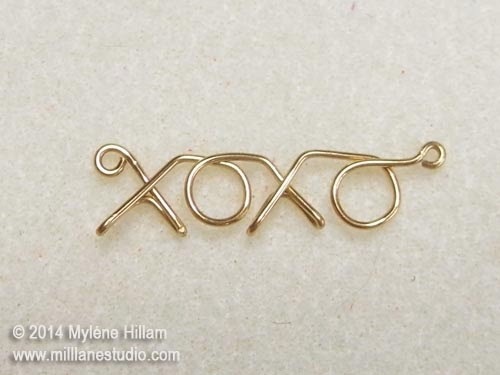 Hugs and Kisses abound on Valentine's Day! 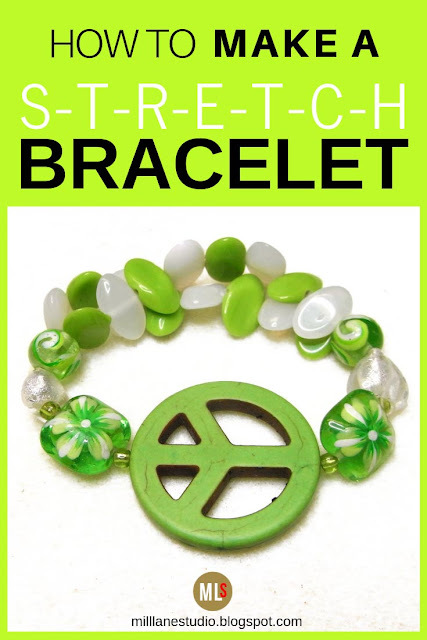 And this darling little bracelet says it all - XOXO - how adorable! On my recent trip to California I came across a number of great bead shops but one of the best shops I visited was Legendary Beads. Their selection of beads and jewellery supplies is excellent and I found lots of goodies to bring home with me. 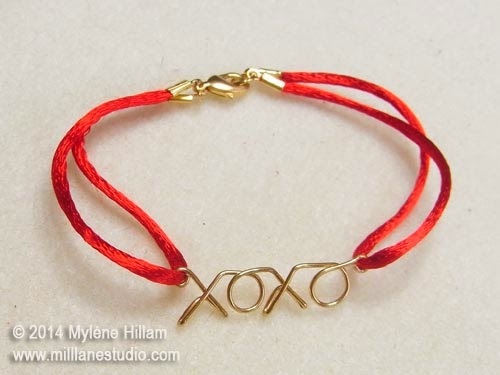 But it wasn't until I was at the cash register finalising my purchases that I saw the fabulous little XOXO bracelet kit. It was very smart placement to have it at the counter - like lollies at the checkout in the supermarket! The display was so cute that I couldn't resist bringing one home with me. 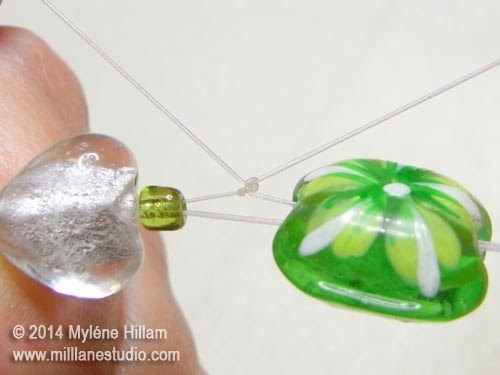 You only need some basic jewellery making skills to put it together but it didn't come with any instructions so here's a few photos that should be helpful. 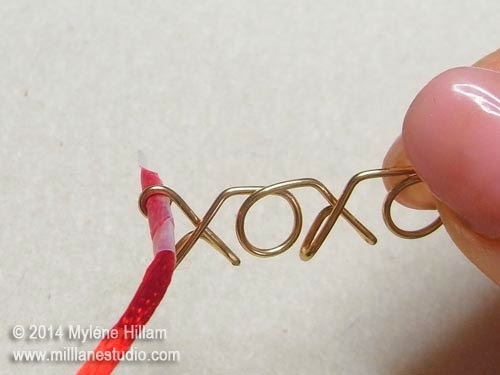 The wirework XOXO is already preformed for you so you don't need any wireworking skills at all. Firstly, you'll need to tape the end of the mouse tail. Cut the mouse tail into two 15cm lengths - a little more if you have wider wrists and a little less if you have narrow wrists. 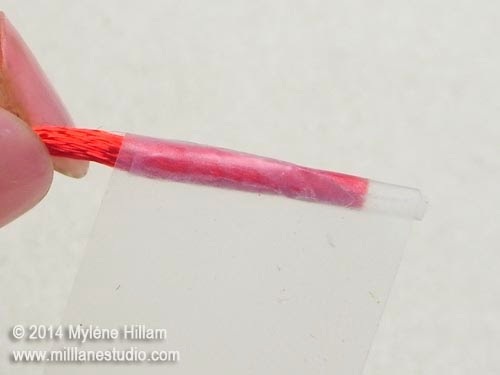 Thread the taped end of the cord through one end of the loop and then remove the tape. 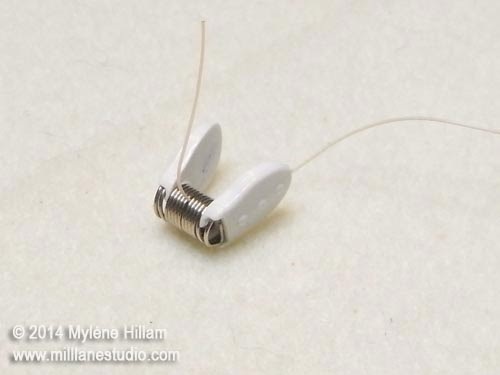 Place the end of the mouse tail in a cord end and fold over one flap at a time to encase the cord securely. For a neater finish, you can use the end-hole of the Mighty Crimper to round the cord end. Repeat on the other end of the cord. 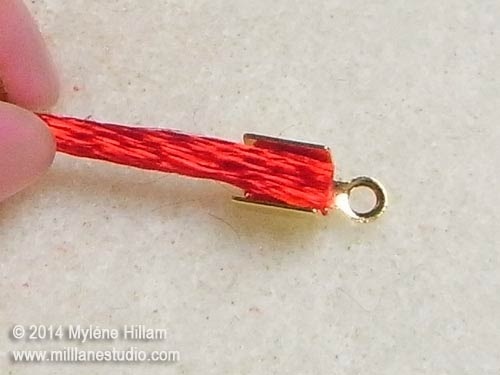 Open a jump ring and hook on the two cord ends. 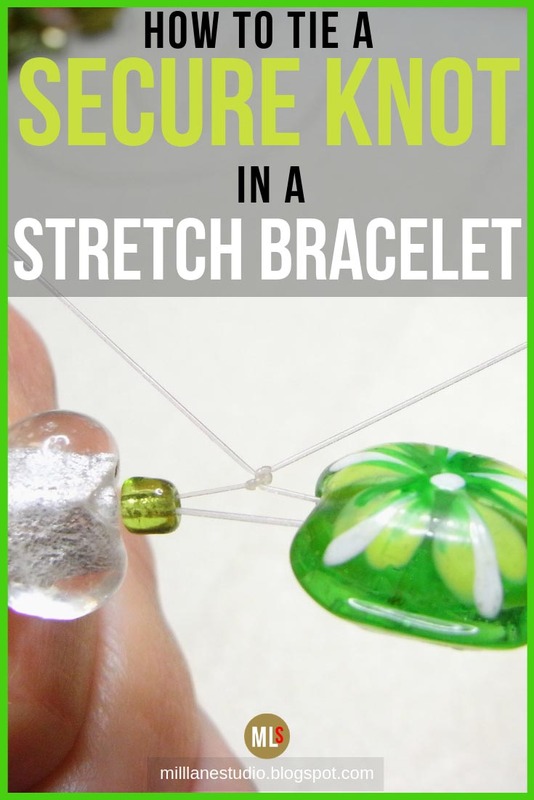 Complete the other side of the bracelet in the same way but add the clasp to the jump ring as well. And there you have it - such a lovely way to say "I Love You"! If you follow my blog, you would have heard me mention CHA and the Designer Showcase before. But have you ever wondered what a Designer Showcase actually is? Well, it's anything that the Designer wants it to be. In the past, I've always displayed my work so that Showcase visitors could get a feel for my style and what it is that I do. But this year, I decided to take a different approach. You see, CHA provided us with a gallery-style pedestal instead of a table, so I created a very minimalist display. And unlike past years where I've had lots of my designs on display, this year I had just ONE finished piece. But, that piece is the hero of my display. I hope it will all make sense by the time you reach the end of the post. In the meantime, follow the pics to see how my Showcase took shape. Let's start with the props for the display. I wanted three round, white boxes which nested inside each other. But having left it until just two days before jetting out to the US to put this together, I had to take whatever boxes I could find, no matter what the colour. With a can of gloss white paint in my shopping basket, I was on my way. 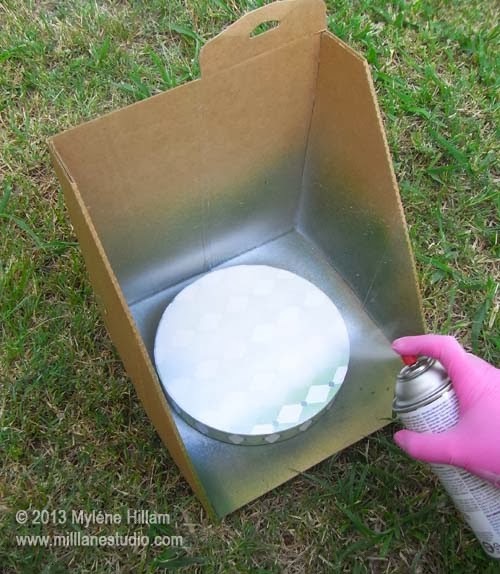 Six coats of paint later, and I had my round, white boxes. Whilst these were drying, it was on to making the jewellery that would be on display: a Faux Barbed Wire Wrap Bracelet. 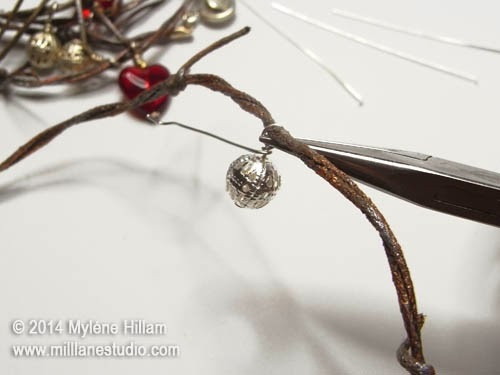 You can see how to make the Faux Barbed Wire here. I made about 2.5 metres all up. 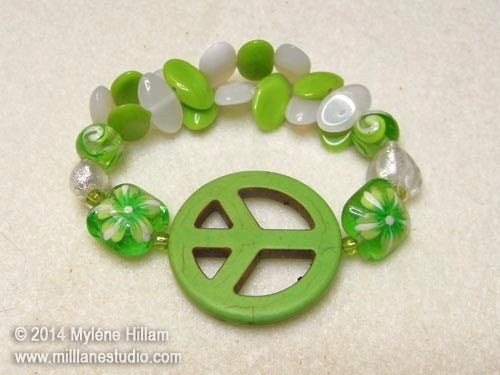 Some was for the bracelet and the rest was to be used to tell the story. At this point, it was time to pack my suitcase and head to the airport. The rest would have to be completed in my hotel room once I got to LA. Once I was settled in my room it was time to start putting it all together. That faux barbed wire I had made was to become writing around the outside of my three white boxes and it needed to be painstakingly applied so the adhesive didn't show. I ran into a spot of bother here because the quick drying adhesive I had chosen for its strength was solvent based.... and so was the paint on the boxes and it immediately began to dissolve the paint. Yikes! No need to panic though because I came prepared with three adhesives and one of them worked nicely. Progress was slow, but the words were starting to take shape.... and to my relief, it was readable! I found these wooden pedestals at the same store as the round boxes and they were already painted white. They just needed a touch of colour to brighten them up. With all the components completed I was ready to set up my Showcase. And here it is! The theme of my Showcase was Concept to Completion and I wanted it to illustrate the design process in a visual way, showing how a spool of simple beading cord could be transformed into a Faux Barbed Wire Bracelet. 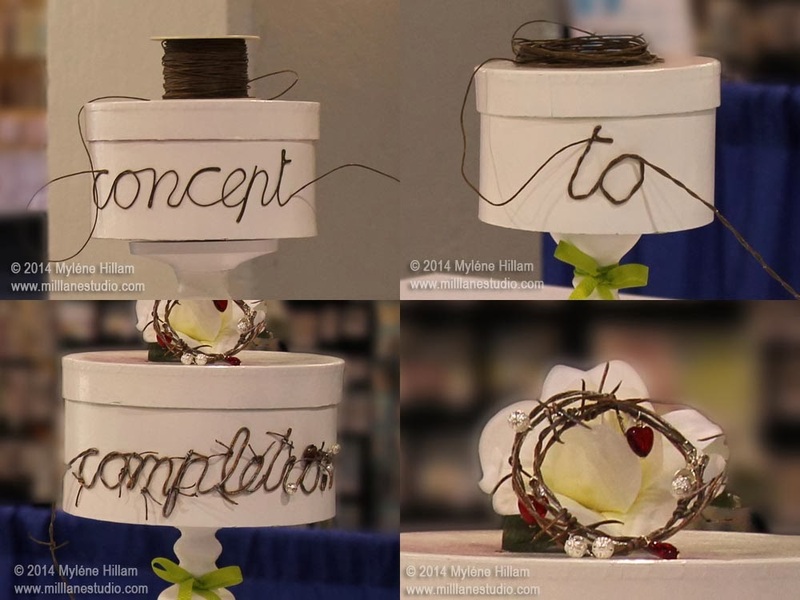 The cord runs in one continuous length from the spool on top of the first box right to the end of the word "completion" on the third box - it starts out as just plain cord and is progressively transformed into barbed wire as it moves from box to box. The bracelet sits on top of the last box propped up on a rose.... such a contradiction - but it's a pretty cool bracelet! Most people actually think it's wire and not cord at all and they're surprised when they pick it up and discover that it's soft to the touch and completely wearable. I love how my Showcase turned out.... and I love that it told a story. It turned out to be a real talking point! 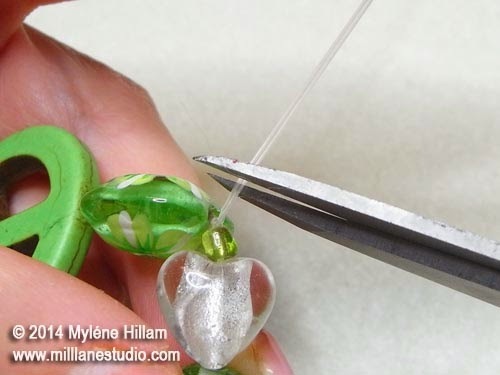 I'm Myléne Hillam and I share lots of my crafting ideas here: Working with resin, jewellery-making, leather jewellery and general crafting. 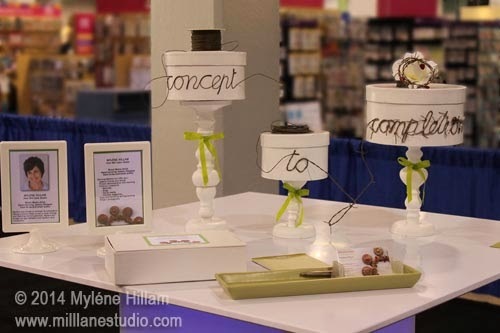 And sometimes, you'll even find my latest cake decorating and party theme ideas. 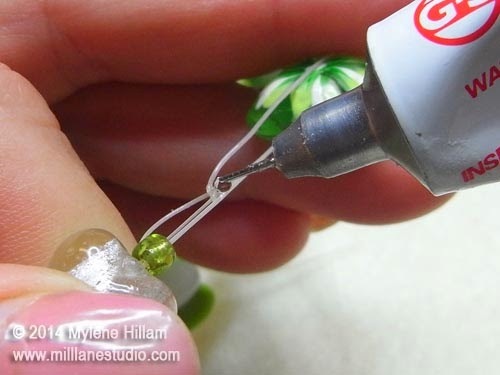 Learn how to make your own Stylish Leather Jewelry. Buy your copy here. 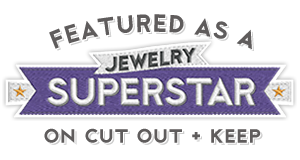 Make fabulous jewellery with nothing but jewellery findings! Click to buy a copy. 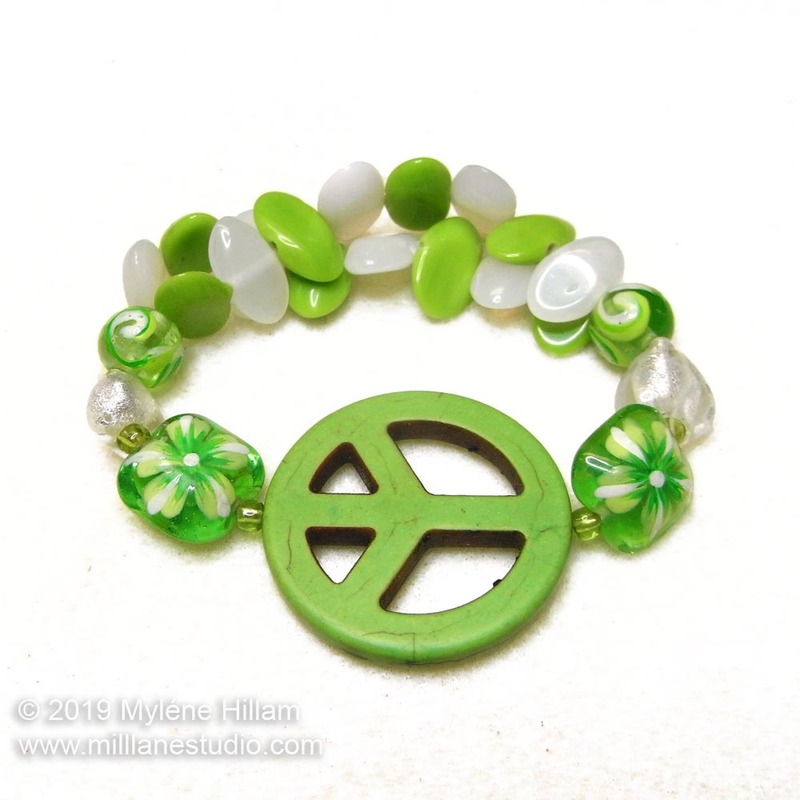 Handmade Resin Bangles for Hard to Fit Wrists! Spoil your yourself with a colourful resin bangle with a sparkly magnetic clasp. 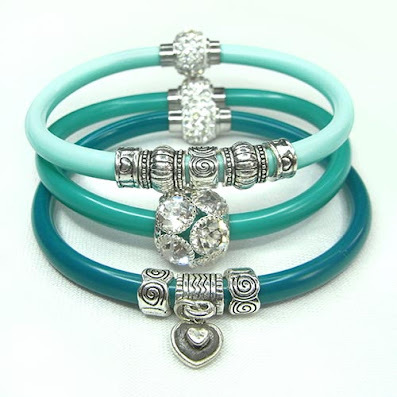 Wear one on it's own, wear a stack of monochromatic bangles or really let your personality show and wear a stack of different colours together. Peronalised sizing available so no matter what size wrist you have, there is a bangle to fit! Available at the Mill Lane Studio Resin Jewellery Shop. 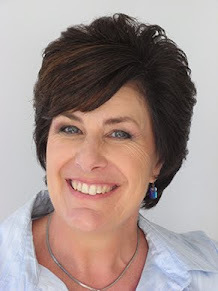 Myléne Hillam is a participant in the Amazon Services LLC Associates Program, an affiliate advertising program designed to provide a means for sites to earn advertising fees by advertising and linking to amazon.com.